What is a Coronary Artery Calcium Screening? A cardiac CT scan for coronary calcium is a non-invasive way of obtaining about the presence, location and extent of calcified plaque in the coronary arteries. Calcified plaque results when there is buildup of fat and other substances under the inner layer of the artery, also called coronary artery disease (CAD). People with this disease have an increased risk for heart attacks. Over time, the progression of plaque buildup can narrow the arteries or close off blood flow to the heart. This could result in chest pain or a heart attack. Because calcium is a marker of CAD, the amount of calcium detected on a cardiac CT scan is a helpful prognostic tool. 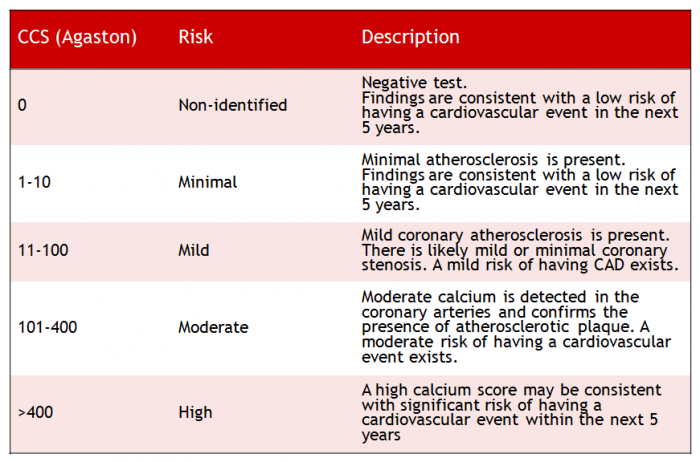 The findings on cardiac CT are expressed as a calcium score. Click here for additional information. Also check out this article CLICK HERE on why CT CAC is the BEST predictor for heart disease.